University at Buffalo Vice President for Health Sciences Dr. Michael E. Cain urges Albany lawmakers to support the second phase of the Buffalo Billion initiative in the 2017 state budget. Funding from phase two of the Buffalo Billion initiative could have a serious impact on the way space is used by the city’s medical community. Of the $500-million proposed by Governor Andrew Cuomo, $20-million is earmarked to help the University at Buffalo expand class sizes in its medical school from the current 144 to 180. “And each of those, we need from the collective amount of funds that we have at our disposal, we have to increase scholarships by 25 percent. We have to increase the infrastructure to support research and education. We have to increase faculty by 25 percent,” explained UB Vice President for Health Sciences, Dr. Michael Cain. Without those increases, the organization that gives the school their accreditation won’t allow UB to increase the class size. And all those extra doctors-to-be, plus the faculty and staff would be headed for the new Jacobs School of Medicine and Biomedical Sciences building downtown. The building, itself, has a price tag of $375-million. But if there’s no money to support expanded class size, UB would end up with something else. “We would have a building that’s bigger than we need and we would not live up to our commitment, which is to increase the number of physicians graduating from the school of medicine that wish to reside in Western New York and help our physician shortage,” said Cain. UB’s downtown neighbors at the Buffalo Niagara Medical Campus would also see an impact depending on the outcome of phase two of the Buffalo Billion, which is supposed to help expand their innovation space. Buffalo Niagara Medical Campus President Matt Enstice urges Albany lawmakers to approve full funding for the second phase of the Buffalo Billion initiative in the 2017 state budget. BNMC President Matt Enstice said the first round of the Buffalo Billion helped jumpstart the growth of the campus from just four companies to more than 150 in just over ten years. It’s a number he aims to double. Enstice said both the companies on the campus and others around Western New York want to see the funding for the Buffalo Billion continue. Enstice said, either way, the campus will continue to grow, but $40-million from the Buffalo Billion will help accelerate it. Enstice will need to know how the state legislature will vote on funding by early April. 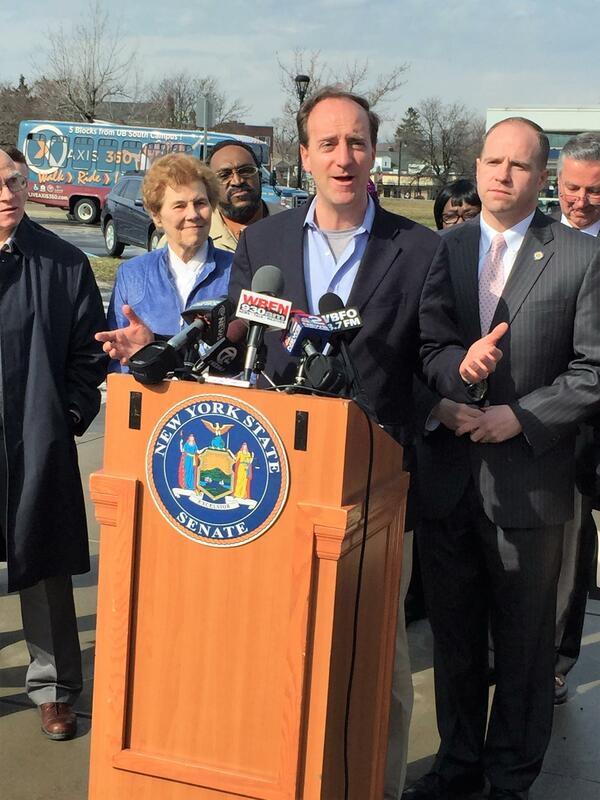 Both Enstice and Cain joined state Senator Tim Kennedy last week in his call for Albany lawmakers to approve the budget with full funding for the Buffalo Billion. In the midst of state budget negotiations for 2017, one local Senator is giving the legislature an ultimatum on the second phase of the Buffalo Billion. Construction is on track for the University at Buffalo's brand new medical school in downtown Buffalo. An update was provided by UB officials Thursday. WBFO's senior reporter Eileen Buckley tells us the future Jacobs School of Medicine and Biomedical Sciences will engage students and the community. 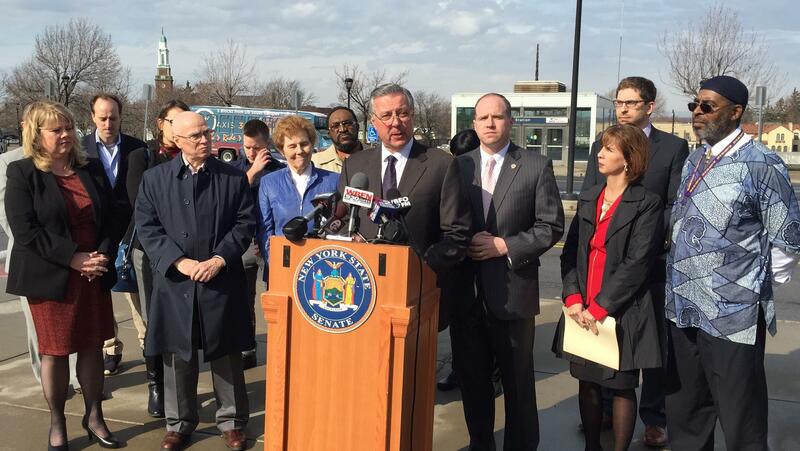 WBFO's Eileen Buckley attended a presentation on the new UB medical school.